Located in the Viñales Valley, the Cueva del Indio is a magical place for kids to visit. In addition to the caves, the area provides some great family activities such as hiking and climbing, as well as some gorgeous rock pools for swimming in the stunningly bright green water. The caves are named for the local Indians who once inhabited them, the Guanajatabey Amerindians, who carved shelters into the limestone rock and hid in the caves from Spanish colonialists. Some of their bones were unearthed in the cave system and their art is still visible on the walls. The caves were rediscovered in 1920 and, with a gallery spanning 27 miles (45km), the Cueva del Indio cave system is very impressive. Travellers with kids in Cuba will find this a wonderful family activity; children will love the boat ride across the underground lake in the cave, and discovering the stalactites, stalagmites and petroglyphs on the walls of the cave. There is a museum and a cafeteria within the cave system. 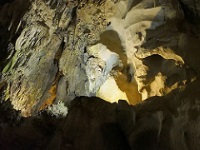 It doesn't take long to take the tour through the caves but it is quite a magical experience and worth a quick detour.